The trained Rehab Indy staff works in conjunction with Aesthetic Concerns Inc. to produce the Living Skin finger prosthesis. 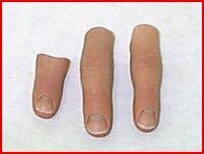 The "Living Skin" prosthesis is a custom crafted silicone restoration, that attaches by suction to the remaining portion of the affected finger(s). A patient can be seen locally at our office for a casting and photo visit. The cast and photos are then shipped to Aesthetic Concerns Inc. to begin the process of fabricating a temporary fitting mold. The patient then returns to our office for a fitting session and a color match to the computer enhanced photos. That information is then sent back to Aesthetic Concerns Inc. for completion of the "Living Skin" prosthesis. Once completed the prosthesis is returned to our facility for delivery to the patient. For more information contact the Rehab Indy staff or visit the Living Skin website.